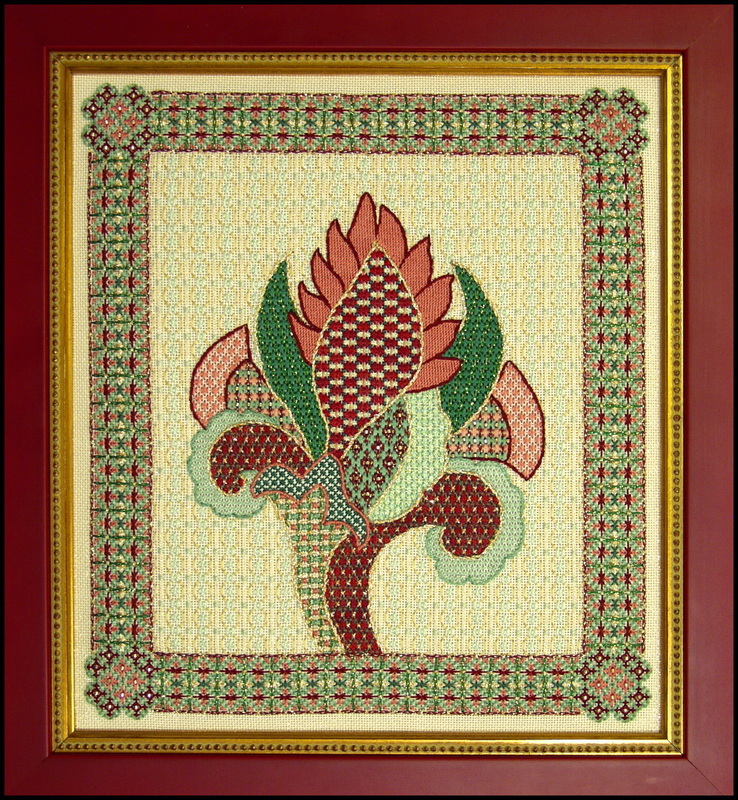 8 3/4" X 9 7/8"
This colorful Jacobean flower is full of unusual original composite patterns that fit the paisley curves gracefully. The elegant open background is a soft vertical stripe that has oval blackwork outlines with Hungarian centers between the laid rows of couched Sparkle Rays. The fancy 7-step border (Ann’s specialty) is the perfect finishing touch. Prework. No advanced preparation required for this class. Kit Contents: #8 pearl cotton, Cotton floss, Kreinik metallic ribbon, Grandeur, Coronet braid, Petite Sparkle Rays, Wildflowers Mill Hill Magnifica seed beads and Subtlety. Student Supplies: Only the 14" X 14" stretcher frame and regular stitching accessories. Color Choice: Blue threads may be substituted for the green threads.